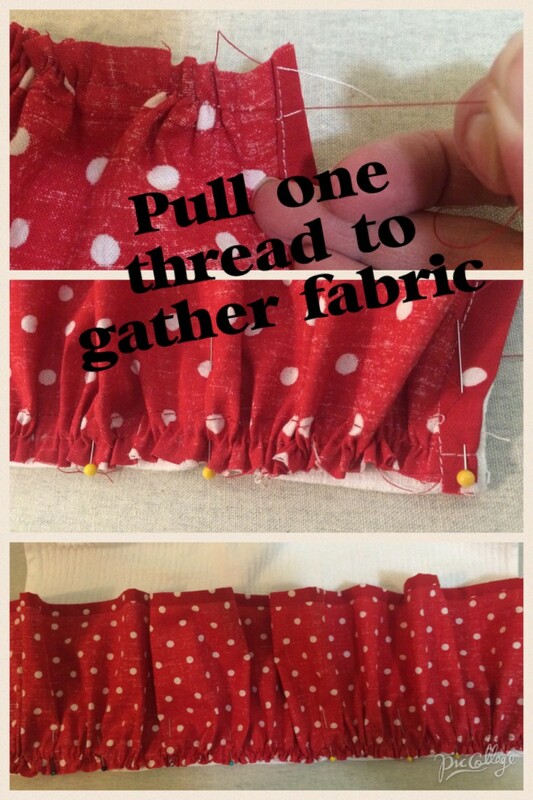 This is a great project to learn how to make a simple ruffle! First gather your supplies. All you will need is a store bought towel and less than 1/4 of a yard of fabric. You can buy the towels in bulk for about a $1 a towel from Walmart. For best results, prewash your fabric and towels, and iron them. 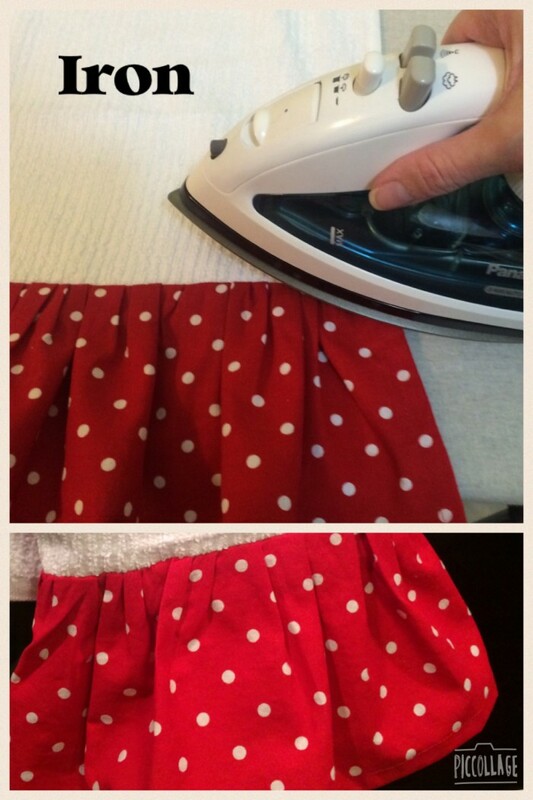 Step 1: Cut your ruffle 6 inches in length by the entire width of your fabric, which should between 45-54 inches long. Your fabric should be between 2 and 2.5 times the length of the towel. Step 2: Iron the bottom of the fabric about 1/4 inch to the wrong side. 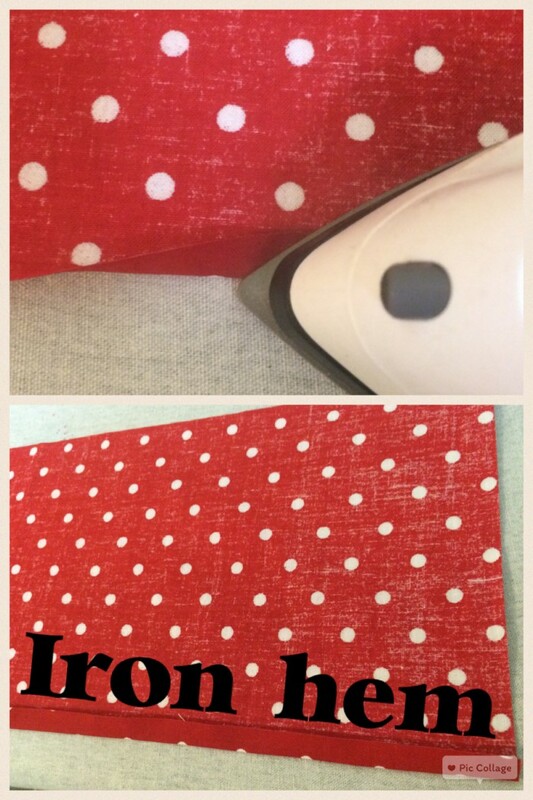 Be sure to iron the entire width of the fabric. No need to measure, just eye it and try to stay consistent. Step 3: Fold up one more time and iron again. 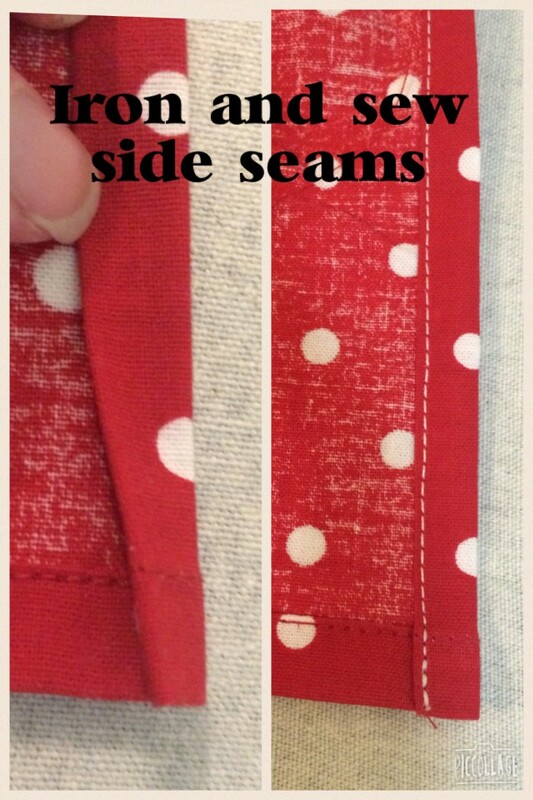 Step 4: Sew close to the left side of the ironed hem to create and nice finished look. I like to use matching thread so that it will blend. Step 5: Iron and sew up the side seams the same way you did on the bottom hem. Be sure to back stitch at the botom. I used a contrasting thread in the pictures below just to show you what this should look like, but I recommend using the same color as your fabric. 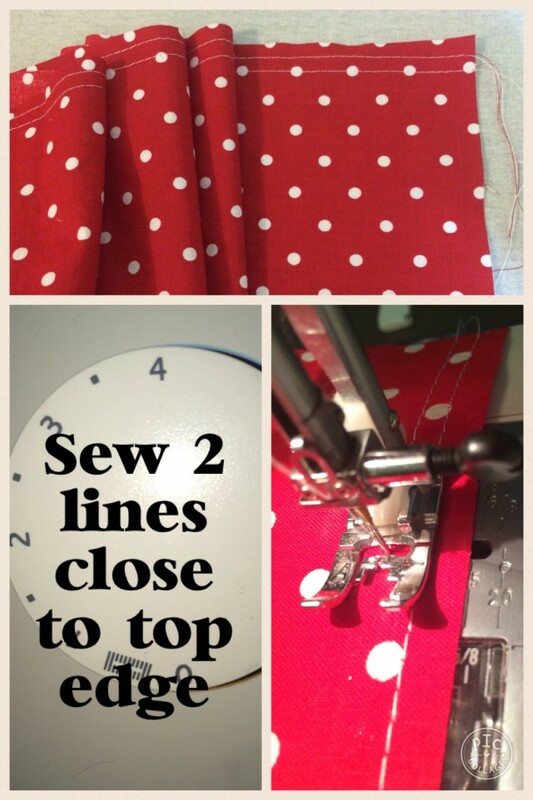 Step 6: Sew two lines, using a wide stitch, at the top of your fabric. 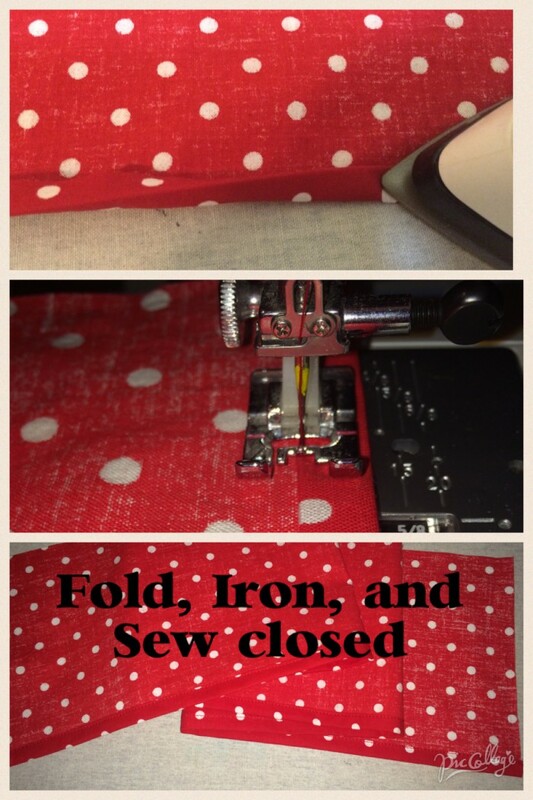 Change your stitch from a standard 2.5 length to a 4.0. 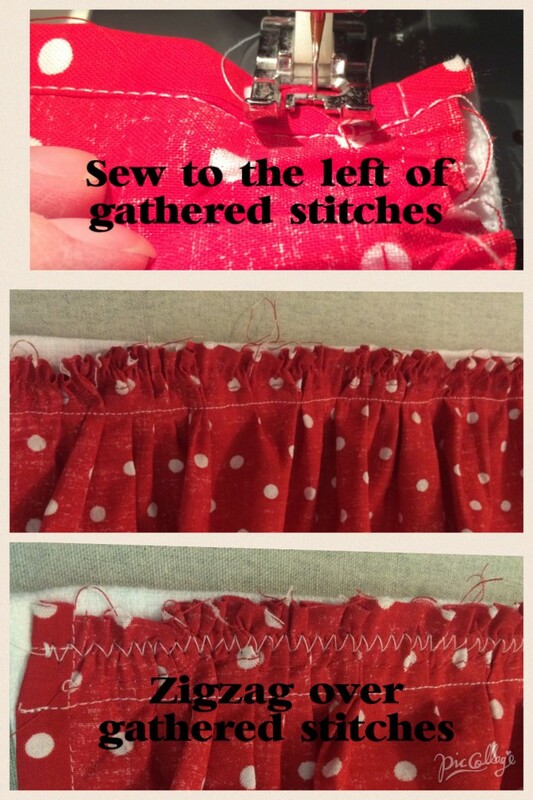 Be sure NOT to back stitch and do NOT trim your threads!! You will use these threads to gather your fabric. Be careful not to cross these lines. They should be parallel. Step 7: Using only one of the threads, pull gently and begin to gather the fabric. Be careful not to pull too hard or you may pop your thread. However, if you do break your thread, just grab one of the other threads from the second line that you stitched. The second line was there as a safety. Continue to gather, and distribute the gathers across the top of the fabric until it is the same length as the bottom of the towel. Step 8: Pin the gathered fabric, right sides together, to the bottom of the towel. Be sure to line up the edges. Step 9: Turn your stitch back to a standard 2.5 length and stitch to the left of your 2 gathered rows of stitches. Be sure to backstitch at the beginning and the end. 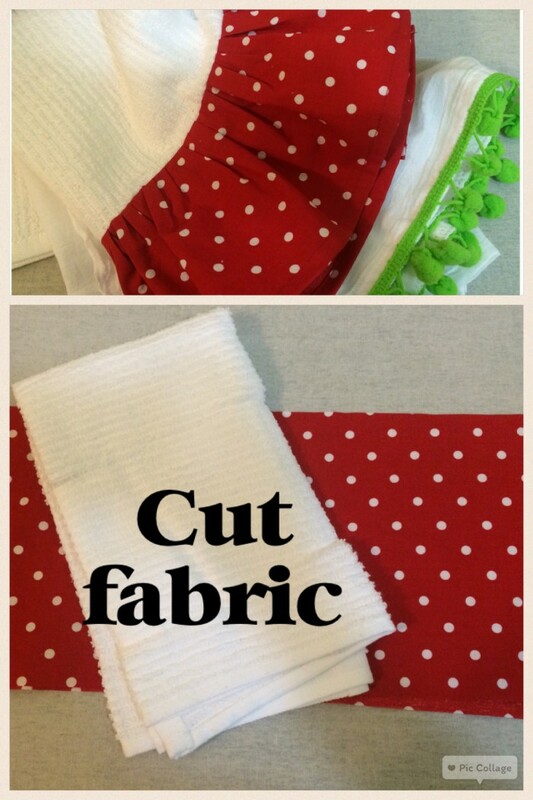 Make sure that the fabric is aligned with the edge of both sides of the towel. Step 10: Zigzag over the two rows of gathered stitches to secure in place and keep from fraying when washed. Step 11: Iron gathered ruffled for a finished look. Enjoy. 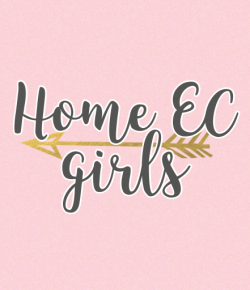 These towels make a great gift!